Don't let customers visit your website but then they leave the site in silent absolutely. 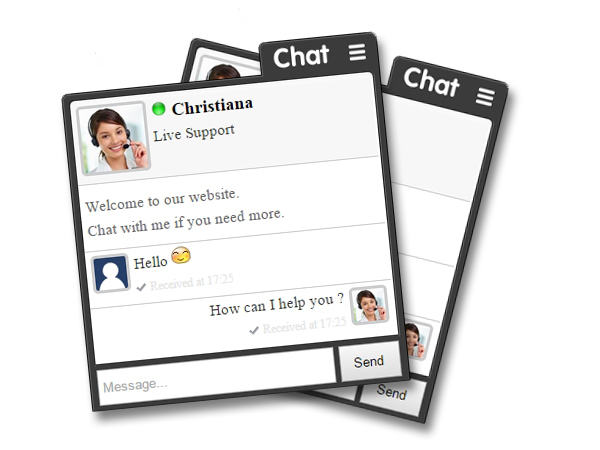 uhChat helps you create a chat box embed in website to chat with them in a professional manner. We give you a tool to create free chat box (and no-ads) embedded into web pages to help customers access the web can chat with you directly without login. Usually they are afraid to share information and uhChat made this process become simple than. According to the statistics of internal relativity, we have risen to 6500% of communicating information between the client and admin of the website since the live chat is used, than 65 times. That is great for a business, adding a customer is an opportunity to earn extra money. We are actively finishing features, ensure the connection speed, smoothness and email security information in a coherent way, constantly evolving towards multi-platform, multi-device connected, simple manipulation of use but powerful configuration and performance use. We always offer a free platform, not a commercialized software. However uhChat still provide extra fee regime and warranty guarantees depending on the form using the tools cheaply than other similar services other. accountCreate a new account at uhChat to be able to login to the control panel and chat with your customers. Account registration includes an email just being used and create a new password. into websiteAfter registering you will receive an HTML code snippet and just copy the code and paste it into your website. Position above the </body> tag or footer section. Contact the web designer or uhChat support if not yet done. designChat box was displayed. Now you need to change chat window color according to their preferences? Access Control Panel > Settings and select the type of window you prefer. You can also change the avatar, name support, and many other settings. uhChat is a compact software is packaged in the form of chat window integrated in website to help visitors can chat online with Admin privately and quickly. uhChat easily integrated on any website source code, easy to use for amateurs, advanced security system with cloud computing, free and no-ads unique in the world. 3What should be do to be able to integrate into the website ? The integration is quite simple without much programming knowledge. Just paste the HTML code on anywhere on your website. To get the HTML code, you must register an account. 4My website layout be affected after attaching the code or not ? uhChat code does not intervene in any part of your website. The chat window will display at the bottom (right) of the site independently even when using mobile devices. 5Can I integrate into many different sites? Completely. You can integrate the chat window on many different websites simultaneously. Just paste the HTML code into website that you want to integrate. 6How do I know visitors are chatting from where ? When logged in as an administrator, you will be informed in detail about the information of visitors, including their web pages are viewed, previous websites and their addresses on the map. 7How to change chatbox's tone ? To change the tone, you can access the Settings section and select the tone you prefer. Here you can also change chatbox's color and other configurations that you want display. uhChat source code is distributed worldwide, but we always kept secret for customers. When you can hear Bing Boong at any website and they're using uhChat. uhChat effective in attracting visitors to chat with Admin because continuously online features , automated chat and simplify input in a smart manner. 1Ensuring your email is real and this email must be active to be able to log in the system. Email must be in the form of traditional and not misleading in terms of content. 2A chat box can be embedded in many different sites but every site is used only a single chat box connected to a single email address. 3Do not upload avatar images, business logo or edit content that depraved, violent, reactionary or violations of current national legislation. 4Do not upload the code has the ability to execute commands unauthorized intervention into the system or use black-code to edit system intentional. 5Do not use the chat box embedded into web pages that depraved, violent, reactionary, or violations of current national legislation. 6Comments, votes, rates or talks about uhChat honestly on forums, press, online support tools and all social media networks. 7Self responsible for your data if stolen passwords and access information. Please contact the administrator immediately if you suspect that happen. 8When using the chat box means that you agree with all the terms used by our rules and take responsibility for your acts. 9We may change the terms at any time and we will email you when the term be updated. All contact, questions, comments and recruitment requests, cooperation please send the e-mail to address uhchat@gmail.com. We are always willing to listen your opinions and appreciate this contact.